In the fall semester of 2012 Ron Fowler’s GRA3112C Typography class collaborated with the FSU Film School for a class project. The BFA thesis Film School students were paired up one-to-one with Studio and BFA Design students to produce posters promoting their movies. This became a valuable learning experience. The design students learned to communicate with their “clients” and interpret and translate the film school student’s design requests. It was also an excellent tool to learn industry standards for print preparation of large-scale graphics. The collaboration was well received by both departments. 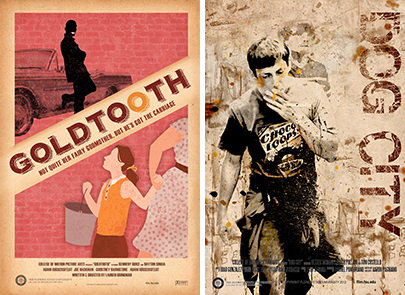 The poster artwork was displayed @ the Film School Thesis screening on December 15, 2012.